You’ve covered me for years! In Norway the normal bedding exists of a fitted sheet that we sleep on, a down/feather or synthetic duvet, covered with a duvet cover, that we sleep under and a couple of pillows. It’s not the norm like I’ve seen in US, to just sleep under a thin sheet, or sleep under a sheet that’s between us and the duvet/blanket. Because I don’t use that extra sheet, I change the duvet covers pretty often. So you can see how flying down/feathers is becoming a problem. I’ve had my duvet for years, so it’s not really all that surprising it’s throwing in the towel. Thankfully I have an extra duvet laying around so I don’t need to go and buy another one (which is really good as they are expensive over here, if you want a decent one). Today I have to say goodbye 😦 I’m sad to see our parting ways, because you have served me well all these years. You have always been there! To keep me nice and warm on chilly nights. You have been around for sad days and sick days, allowing me to hide under the covers. You’ve been around for snuggle days, reading or watching tv in my living room. You’ve even been outside with me once or twice, on beautiful winter days just sitting enjoying the weather. You’ve seen me at my best and my worst, and you’ve followed me from home to home. Sadly this is the end of the road for you. I would have loved to reuse you for something, but I’m not sure what that would be right now. Refurbish you is to expensive, compared to replacements. And you know that your goose down brother, who is “hanging” around in my closet, is chopping at the bits to come out to play. So long, my trusted friend! 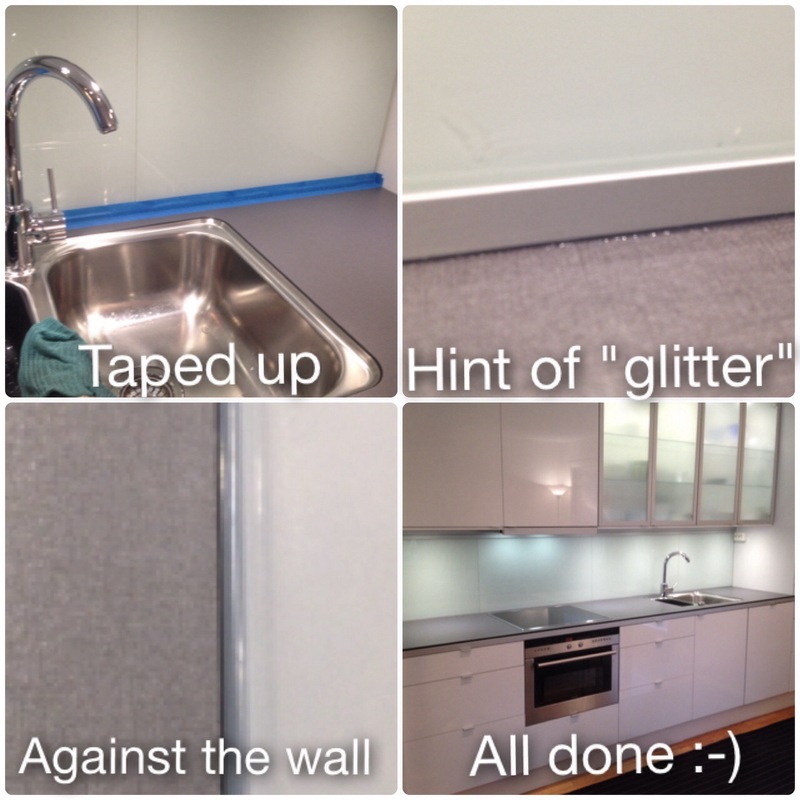 Day 8 – clean up day! 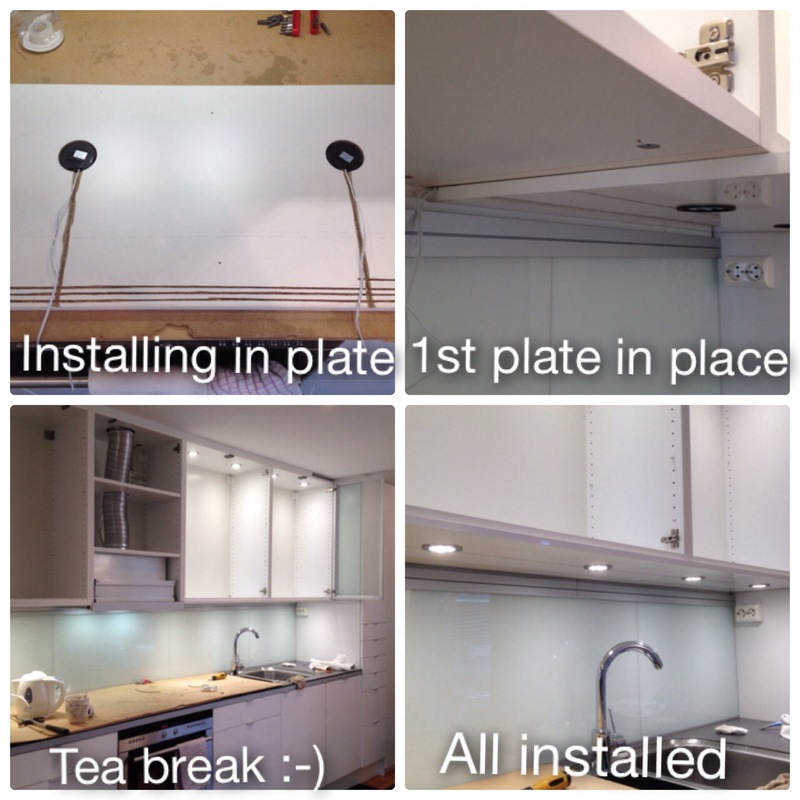 The last day of kitchen work was pretty much dedicated to getting the last bits and pieces in order. I decided that since I was going to do all this work on the kitchen, I might as well do the yearly cleaning of the kitchen at the same time. You know, that job where you empty everything in your drawers and cabinets, and wash the units and the stuff in the unit. After everything was nicely put away and I had my kitchen back, it was time for that last crucial detail that needed to be done. 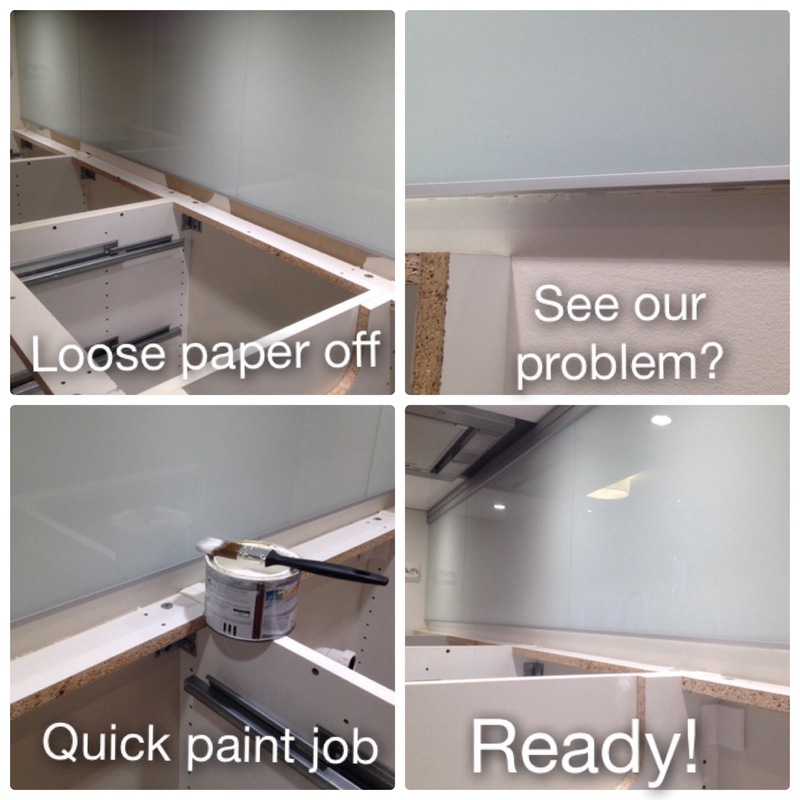 Caulking (with silicone) around the countertop to make sure no water could go were it shouldn’t go. Since the crack between the countetop and the backsplash, was barely there, I decided to use blue tape to help me out. I taped the kitchen counter and taped the backsplash, so only the crack to put the clear silicone sealant in, would be open. This helped a lot in being able to push silicone into the crack without being worried about getting any mess on the countertop or backsplash. If I may say so myself, the end result is really nice. You can’t really see that there is any silicone there except for a little bit of glitter when the light hits right. 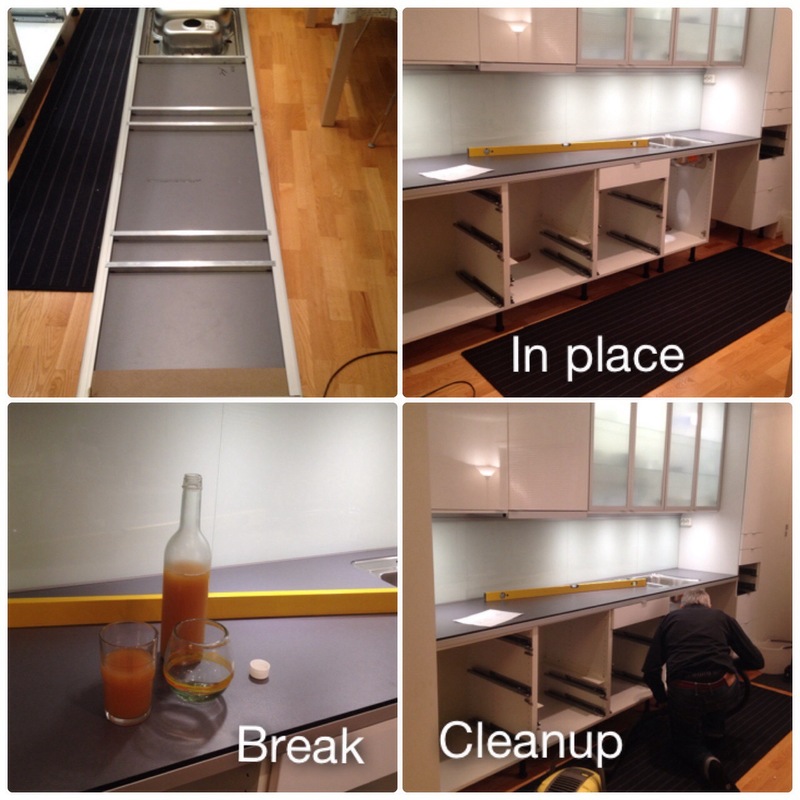 One final wipe of the kitchen counter, and that concludes the kitchen project 2014. What we needed to do was cut out the hole for the cooktop. First we measured everything out. 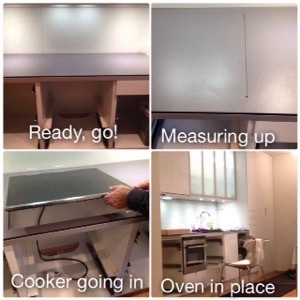 We put the cooktop upside down on the counter, in exactly the spot where we wanted it, drew a line around it, removed the cooktop and measured about 6 mm in from the line we drew, and drew up the cutting lines. The cooktop “lip” was only 10 mm, and we needed a tiny bit of wiggle room, so we decided to go for approx 6 mm so that the “lip” still had some support. I told you my countertop consist of a 10 mm thick laminate, right? Well let me tell you, 10 mm of pure laminate is hard, super hard to cut in. I remember when we installed the original countertop, how my dad swore more than once over how hard is was to cut the darn thing with a jigsaw. Not only was it hard (I believe my dad broke a sweat and a blade) but it also took forever. So this time around I thought maybe I could use something else. First I tried my Bosch Oscillation multi tool – effective, but still very slow going, so I figured… nahhh. OK, what’s next…. well there is the grinder… Which is a scary effective product, and it’s fast, almost too fast. “Boy do you need a steady hand if your going to try that, because if you are just a tiny bit off, you’ll ruin everything”. Hmmm, would I, would I even dare to? Thankfully I still had the cut off from the original plate, so I could practise 🙂 It was fast… I decided to take a chance..
NOW, I would NEVER recommend anyone ever doing this, you would have to have a rock steady hand, and a sick amount of confident, and it can still go wrong, very wrong! So NO, do not ever use a grinder to cut out the hole for a cooker in a kitchen bench. Please use a jigsaw as the instillation guide will tell you to do. I knew the grinder would produce an insane amount of laminate dust, so we covered up the area really well to try to keep the dust contained. Even so, it still seeped a little into my kitchen cabinets and onto the floor. This was not really a big deal, as I had decided that part of the kitchen “renovation” would also include cleaning all my kitchen stuff, and all my kitchen cabinets (saves me from doing it for Christmas). OK, here goes, I’m all decked out in protective gear, mask, glasses and ear protectors. The kitchen is all decked out in plastic, tape and I have this big “bag” behind me that will collect most of the dust. And, I’m nervous! What if I muck this up? Putting the oven in it’s place afterwards took all but two minutes. A good vacuum, and a washing later and this concluded the work for the day. 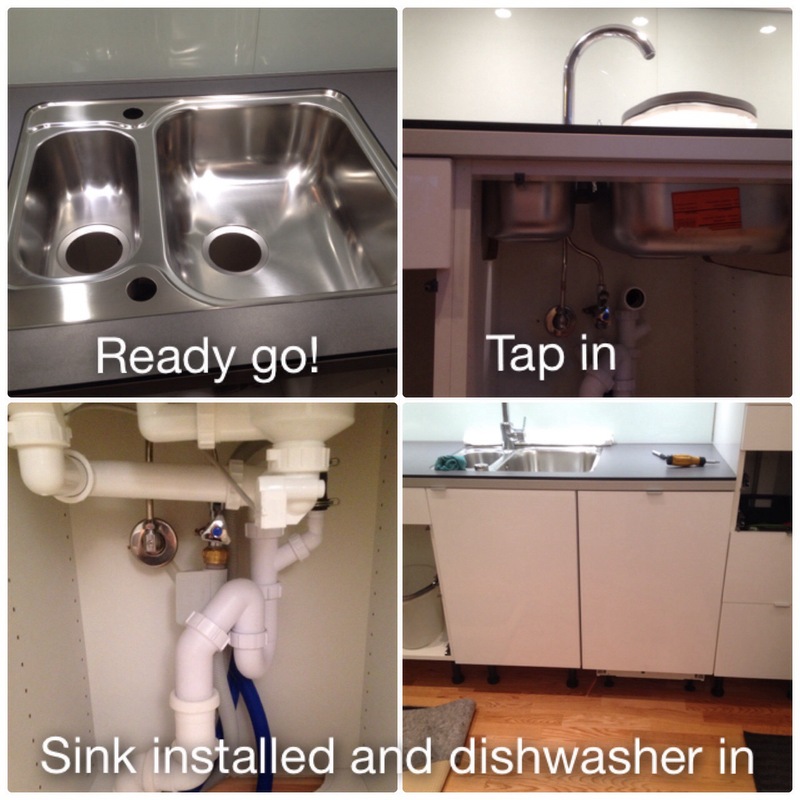 Day 6 was dedicated to installing the tap and installing the plumbing for the kitchen sink and dishwasher. It was a little bit of fiddly work, but kinda fun. First one out was the tap! My new sink is not quite the same as my old one (the old one had gone out of production), so the measurements are a little different, and because of this, the hole for the tap was not quite in the same place as my old one. So we had to do some adjustments to the piping to make everything fit. It’s not difficult work, but for some reason (just like with everything else) it’s time consuming. It was wonderful getting the tap in, tested out and have everything work like a charm. Sink time! Remember I had practised where all the plumbing would go? Well, this served us well. It made the installation much quicker and easier since we knew which pipe had to be cut and knew which pipes to connect to each other. 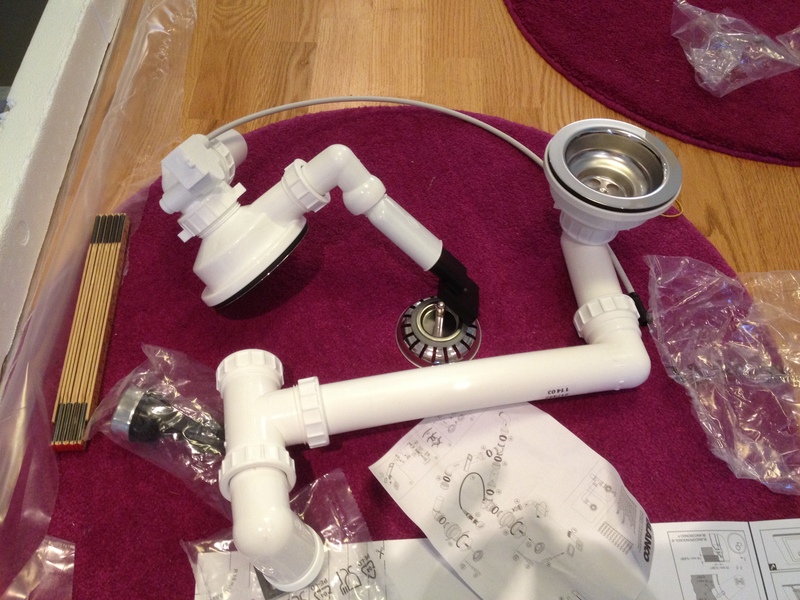 It didn’t take long before the plumbing for the sink was in, and it was time to test everything. 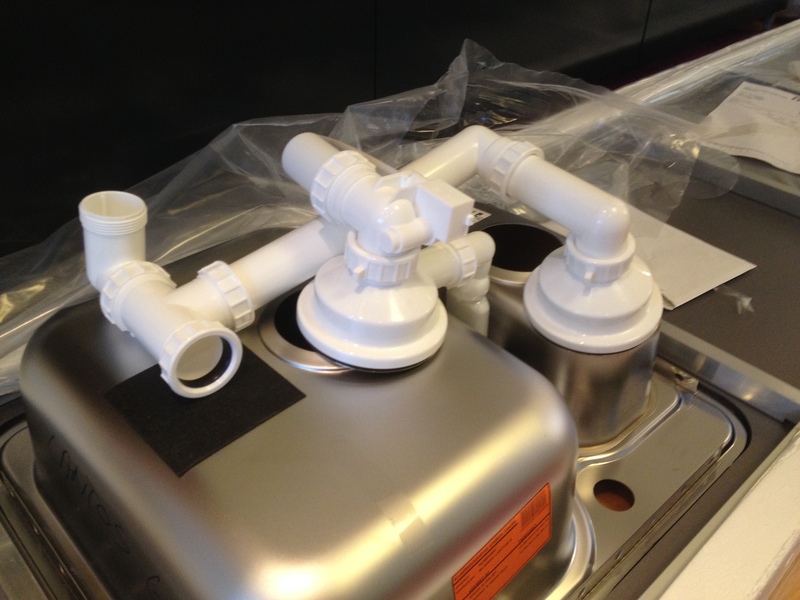 and presto… no leakage, hurray!!! Dishwasher next, this actually took a minute, not because it was difficult to install the piping and water, but because we had to spend some time getting the machine just perfectly situated in it’s spot, level it out and fasten it to the countertop, to make sure it didn’t move while pulling at the door. Well, let me tell you! I was seriously NOT loving my kitchen countertop a few days ago! We started up reasonable well mid day. 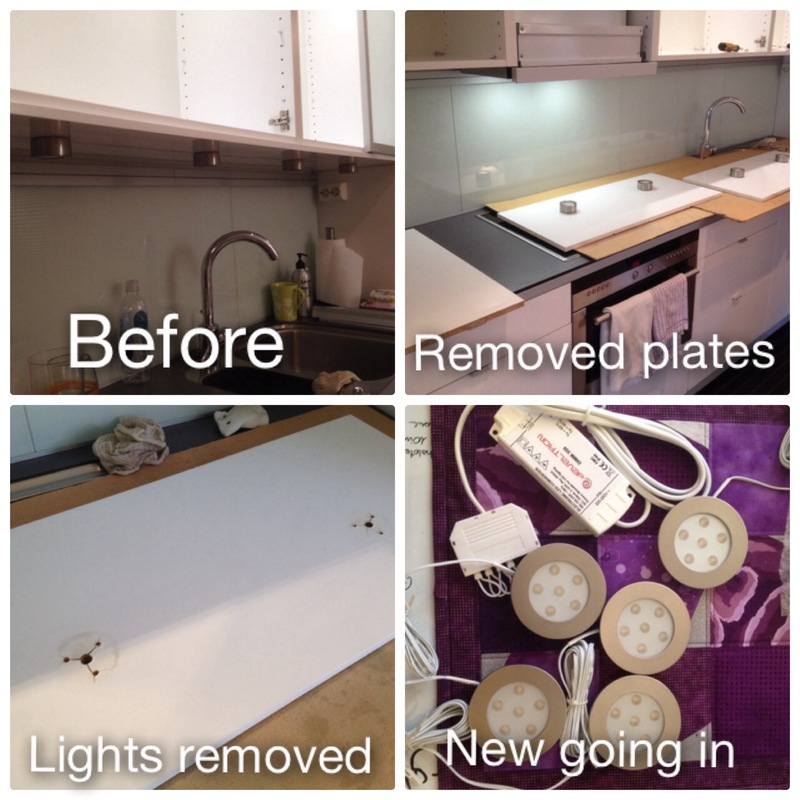 We removed all the drawers, everything in the cabinet, the oven and even the cooker came out really easy. We moved over to the dishwasher, turned off the water, managed to remove the dishwasher hoses with not to much trouble (even though it was cramped under the sink) and moved the dishwasher away. Moved on to loosening the plumbing for the sink and tap. We got to all the screws to the countertop and got all that out, easy peasy. All took but a hours or so. I have to explain a little – we kinda new we would have trouble. You see I have a backsplash over the countertop, that, because of the way it was fastened to the wall (clip system) there was no way to remove it. 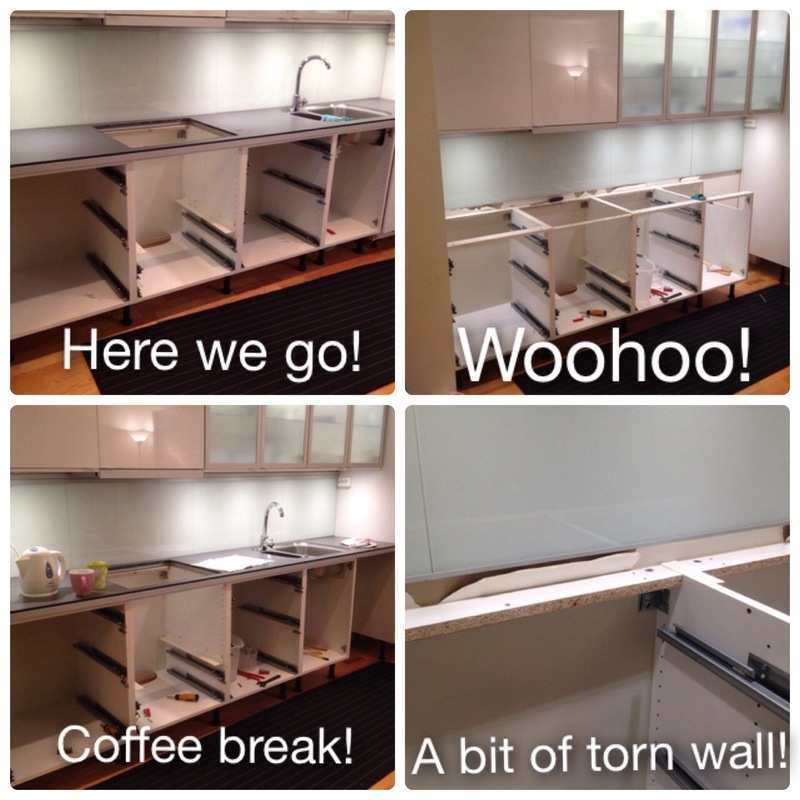 It was either break the glass, or tear the fittings from the wall (leaving big holes in the plaster), and I didn’t fancy doing either, since I kinda wanted to keep the backsplash intact. So we had to move around the issue. Now, that wouldn’t have been a problem, if it hadn’t been for the fact that my dad did such a super job, using silicone when we put the countertop in (which was absolutely the correct thing to do). There was silicone between the countetop and wall, and there was silicone between the countetop and the backsplash sitting on top. And since there was NO way to get to the silicone between the countertop and the back wall (because of the backsplash) you can see why we were having such trouble. After cutting whatever silicone we could get to, pulling and prodding, “tearing” and swearing 😉 throwing our muscles to the thing, with no effect. 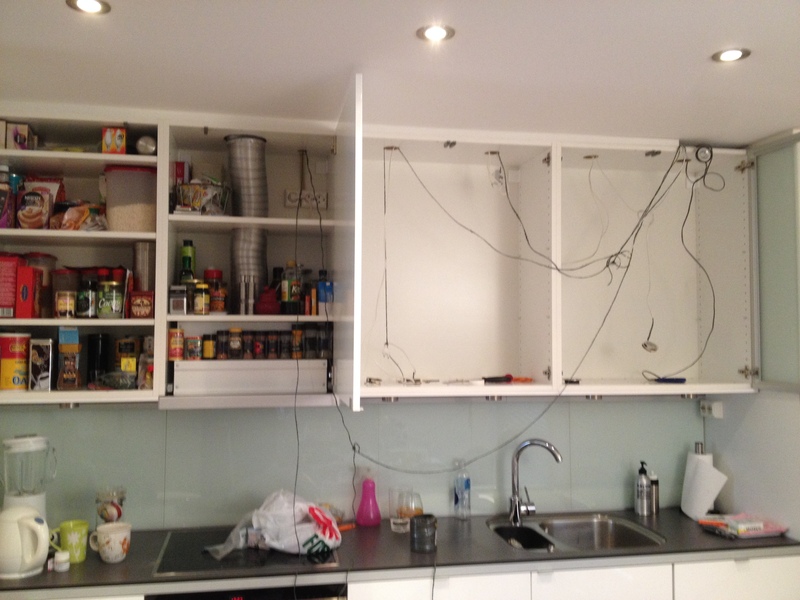 We seriously started to contemplate removing the kitchen cabinets under the countertop, so that we could knock the damn thing off the wall (this was about 1,5 hours into trying to pry it loose)…. We didn’t do much yesterday! The next stage – pulling out the countertop – is a big job, and we decided we need a whole day for it, not just an afternoon. 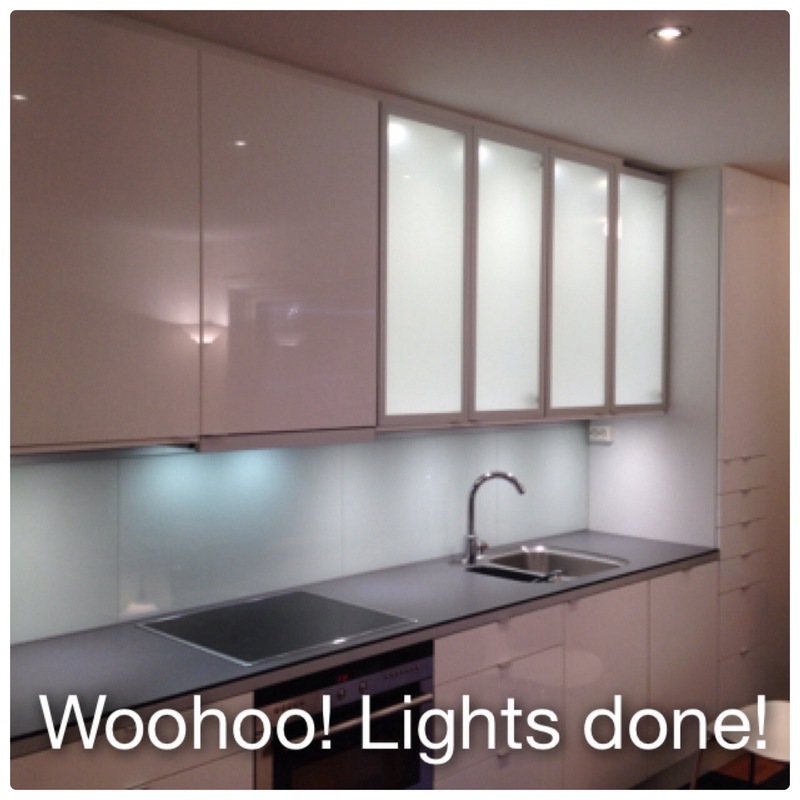 First up was the 4 lights, that are inside the glass door cabinets. So I promptly had to give up on that! Which left me we only the small holes the old lamps was in, and the not even 2 fingers high sliver of an opening on top, to navigate all the wires/cables/transformers. As you can see from the picture, I ended up using a lot of rope (I figured this would be the only way I could pull the new wires). It looks really good, but I’ve come to realise one small mistake. Installing the lights, you could either fasten them with small screws or a clip, I used the clip (it was easy), but have realised that if I ever need to change them out later, I will have to “break” the rim of the lights, to push them through the cabinet, as the spring loaded clip won’t let me remove them the right way. In hindsight, I should have tried to use the screws or a small dollop of acrylic to fasten them. That would have made any potential future removal easier. Hopefully I won’t ever have any issues with these, and since they are of a type where it is possible to change the led lights without changing out the whole lamp, there is hope I will never have to change the lamps again! 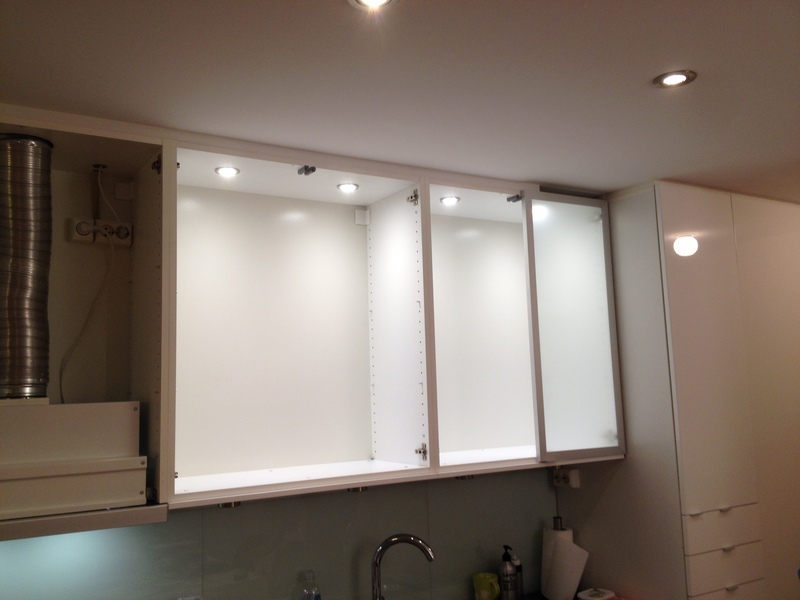 I just figured I’d give you a heads up, if you are ever installing upper cabinet lighting, and have less to no space to work with (like me), my recommendation is to not use the clips, if they won’t let you remove the lamp the same way it goes in.